Today could be the storm before the calm. Three new polls are in, all with surprising and significant results. First the good news for Bush. Washington State, which has been pro-Kerry all year, is now an exact tie. Could Bush win Washington? Until today this seemed very unlikely. Now the bad news for Bush, and it is really bad. A new Rasmussen poll conducted in Florida over the two weeks ending June 29 shows Kerry with an 8-point lead in this key swing state. Even worse is a new Survey USA poll taken June 28-30 in Michigan showing Kerry with a 10-point lead. By our metric, this makes Michigan a safe state for Kerry, but don't you believe it. Maybe this bump is due to all the Michiganders going to watch native son Michael Moore's movie, Farenheit 911. Who knows, but Michigan is definitely still in play. Stay tuned. 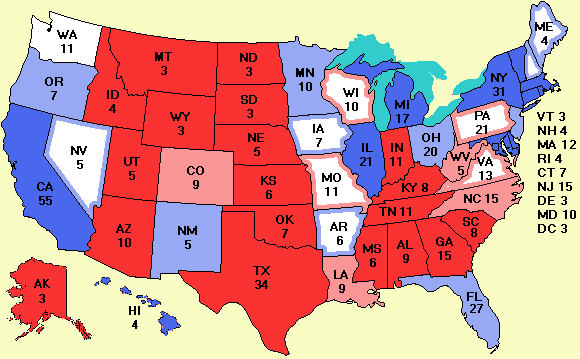 But for the moment, Kerry is ahead nationally. The July 4th weekend will probably be calm, without too many polls. Whatever your political preference may be, have a good holiday weekend. To get the dates and sources for the polling data, click on the Excel spreadsheet at the top right. If you like this website, please link to it to improve its Google PageRank and tell your friends about it.